Mobile technologies – like smartphones, laptops and tablets – are enabling road warriors to stay productive when away from their desks. The downside is that sometimes when you're working remotely, you'll encounter an email or document that needs to be printed, but you're nowhere near a printer. You definitely won't want to carry around a 40-pound (18.1kg) office printer and a portable generator in your car just to print in between appointments. Fortunately, companies like Canon and Epson offer wireless travel printers with batteries that make mobile printing as simple as mobile computing. Examples of these solutions include the Canon Pixma iP110 ($249, £158, AU$307) and Epson WorkForce WF-100 ($249, £158, AU$307). Delivering print speeds of approximately six pages-per-minute in black-and-white and three pages-per-minute in color, either printer will be able to handle your business documents and office files. The WF-100 weighs about the same as an Ultrabook, coming in at 3.5 pounds (1.6kg), and measures 12.2 x 6.1 x 2.4 inches (31.0 x 15.5 x 6.1cm). The iP110 weighs slightly more at 4.3 pounds (2kg) and shares similar dimensions to the Epson, measuring 12.7 x 7.3 x 2.5 inches (32.3 x 18.5 x 6.4cm). 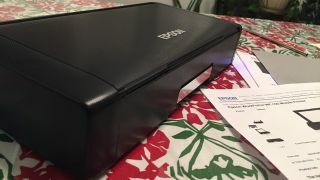 The battery is included in the cost of the Epson mobile printer but not with the Canon. It's definitely an accessory that you should invest in if you want to print from the road. These solutions are great for lawyers, insurance adjusters in the field, contractors who need legal documents signed in person and the executive who may need the occasional hard copy while traveling. If you're working at a remote office, shared office space or a location that has a workgroup printer, all you need is your phone. If you can connect to the same network that the shared printer is connected to, you can use AirPrint on an iPhone or download a printing app for the printer from the app store and print wirelessly. Many big printer manufacturers – Canon, Epson, HP, Ricoh, Samsung, Brother and Konica Minolta – offer mobile print apps that allow you to print without much configuration from a phone or tablet. Unfortunately, this solution may not work everywhere, as it requires you to tap into the same Wi-Fi network as the printer, which could be a security imposition on your host. Some office printers, like the HP Color LaserJet MFP M277dw ($429, £273, AU$528), also offer NFC printing. Owners of NFC-equipped Android and Windows devices can tap their phones and tablets to the printer to initiate printing. Unfortunately, the NFC chip on the iPhone 6 and iPhone 6 Plus is locked to Apple Pay and won't work with NFC printing.